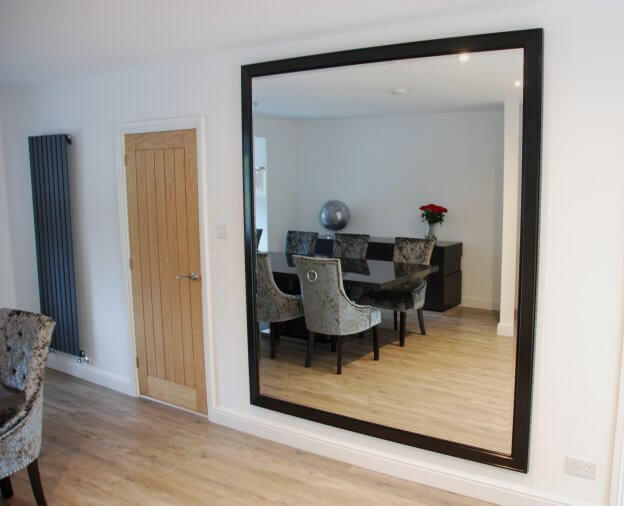 A customer came in a few weeks ago with a very particular challenge – he wanted a very large mirror with a glossy black frame to complement the modern black, white, and grey decorative scheme of his home. It was soon clear that it needed to be huge – 6 feet by 7 feet! And it had to be shiny, and it had to have presence on the wall. I discussed a range of options with the client including a number of modern factory finished mouldings from which we could make a bespoke frame. It became clear that these would not have the presence or scale that he was looking for. So I proposed my truly bespoke option where I would build a frame from bare wood and then hand finish it in a gloss black finish. The frame proved easy enough to construct, although handling a frame of that size always needs a lot of attention. To get the smooth gloss finish on the mirror, I decided that as well as rubbing down the frame by hand, it would be necessary to gesso the flat areas to give the smooth gloss finish. Gesso is a traditional approach to giving a very smooth finish to wood frames, which has been used in picture and mirror framing for centuries. A layer of plaster mixed with glue is carefully applied and rubbed down by hand to give a very smooth finish. Sometimes many coats are needed to get the finish required. In this case, I used two coats and then painted the mirror frame in Farrow and Ball black, before applying multiple varnish coats, carefully rubbed down in between, to give the finish. The mirror glass was 6mm plate, and needed two of us to handle and fit into the frame using special glass handling equipment. We were then ready to go. Part of the brief was to install the mirror. I decided that, given the weight of the mirror it would need a split batten hanging system and anchor bolts to support it on the wall. We made the split batten on the table saw, and arranged delivery. At the client’s house, after a lot of careful measuring, we sank in the anchor bolts into the solid wall, lifted the mirror into place, and it hung completely true on the first attempt. As you can see, the mirror is vast, black and glossy and looks great on the wall, complementing the decor perfectly. This was a great job and a fabulous challenge. I am delighted with how it came out, both technically and aesthetically.